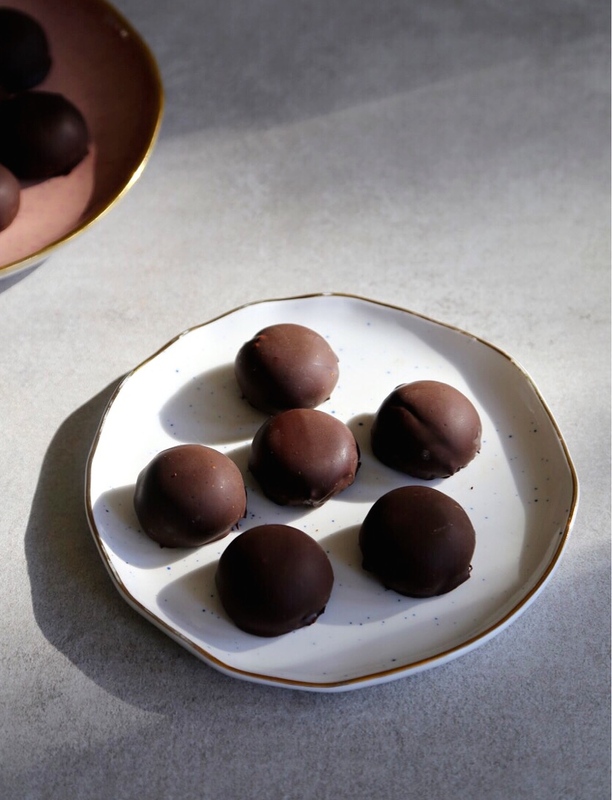 Raw chocolate bonbons are my go to snack, dessert, or even breakfast. For those who are addicted to chocolate, like myself, they are the best to keep on hand for your chocolate cravings. The best part is they aren’t just incredibly delicious but they are also packed with powerful nutritious ingredients such as sprouted almonds, raw cacao and spirulina. Incase you’ve never heard of sprouted almonds, they are almonds that have been soaked for 24 hours causing them to begin to sprout. The almonds are then dried at a very low temperature. This process destroys the enzyme inhibitors, which releases the full nutritional content of the nut and allows the body’s natural enzymes to easily digest the almonds. Overall, sprouting makes the almonds more easily digestible and gives them a greater nutritional value. I purchased a dehydrator so I could sprout then dehydrate my own nuts. If you don’t have a dehydrator you can purchase sprouted almonds from health food stores or you can replace sprouted almonds with regular raw almonds. I use raw cacao instead of regular roasted cacao for it’s superfood qualities. Raw cacao is the purest form of chocolate. Because raw cacao is heated at a lower temperature than roasted chocolate the heat doesn’t degrade its nutrient content. It is suggested raw cacao is the highest source of antioxidants than any other food. If you can’t source raw chocolate for coating please feel free to use regular dark chocolate. Non-raw dark chocolate still is nutritious and contains anti-oxidants. Spirulina is the magical ingredient in this recipe. It is blue-green algae that is one of the most nutrient-rich foods on earth. It has been around for billions of years and is one of the earliest life forms on the planet! Spirulina is recognized to be the most complete food source known, no other food contains as many nutrients. Spirulina is a fantastic source of protein. It has the highest protein content than any other food, which is about 70%. 1 oz of spirulina is 4 times geater in protein than 1 oz of beef! Spirulina may not have the best taste, but with the addition of chocolate and mint it is transformed into a delicious treat. I always keep these on hand to satisfy my sweet tooth. Pulse almonds in a food processor until fine. Add the remaining ingredients, except the dark chocolate, and pulse until well combined. Take a tbsp at a time of the mixture and roll into balls or place into a silicone candy mold in your desired shape. I used a dome shape. Freeze for 20 minutes and remove once firm. Begin the chocolate coating, fill a pot with 2 inches of water and bring to a simmer. Place the chocolate into a bowl that can sit on top of the pot, making sure the bowl doesn’t touch the simmering water. Melt the chocolate using a candy or infrared thermometer to make sure the chocolate doesn’t heat above 115 ° F, so it remains raw. You may need to remove the bowl from the pot before all the chocolate has melted and coax it with a silicone spatula to ensure it doesn’t overheat. Once chocolate is melted and cooled a little bit, to ensure the chocolate isn’t too thin, dip the bonbons to coat. Place on lined baking sheet. Once you have coated all the bonbons, put the baking sheet in the fridge to set, about 30 minutes. *Bonbons can be stored in an airtight container in the fridge for a week or in the freezer for 3 weeks. This entry was posted in Dessert and tagged Antioxidants, cacao, living food, raw, raw chocoalte, raw foods, spirulina, sprouted almonds, sprouted nuts, superfood, Vegan. Bookmark the permalink.